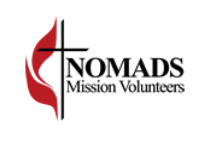 Nomads On a Mission Active in Divine Service - NOMADS provide volunteer labor for United Methodist organizations. NOMADS demonstrate God’s love through our work and by listening to the people with whom we work. We do new construction, remodeling, and repairs for churches, children’s homes, camps, colleges, outreach missions and disaster rebuilding. Team members do maintenance, cleaning, painting, electrical, drywall, sewing, flooring. With God’s help, NOMADS pretty much do it all.